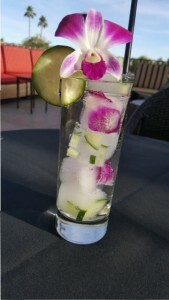 This Valentine’s Day, with a little help from The Casablanca Lounge here in Scottsdale, you can make that special someone a fantastic cocktail! Of course, if you don’t fancy yourself a bartender, you can visit Casablanca and have one made for you! About Casablanca Lounge– Find yourself caught between the past and future, in an elegant cocktail haven that flirts with both timeless old-world style and forward looking innovation. Enjoy barrel aged beverages in Casablanca’s progressive lounge area or an exotic cocktail on one of their panoramic balconies overlooking Old Town Scottsdale or Camelback Mountain. Combine first 4 ingredients shake with ice. Top with half Sprite and half club soda. Pour over ice cubes and serve with floral garnish. Next → Next post: Arizona Beer Week Returns With Events Galore!